For other uses, see Dune (disambiguation). In physical geography, a dune is a hill of loose sand built by aeolian processes (wind) or the flow of water. Dunes occur in different shapes and sizes, formed by interaction with the flow of air or water. Most kinds of dunes are longer on the stoss (upflow) side, where the sand is pushed up the dune, and have a shorter "slip face" in the lee side. The valley or trough between dunes is called a slack. A "dune field" or erg is an area covered by extensive dunes. Dunes occur in some deserts and along some coasts. Some coastal areas have one or more sets of dunes running parallel to the shoreline directly inland from the beach. In most cases, the dunes are important in protecting the land against potential ravages by storm waves from the sea. Although the most widely distributed dunes are those associated with coastal regions, the largest complexes of dunes are found inland in dry regions and associated with ancient lake or sea beds. Dunes can form under the action of water flow (fluvial processes), and on sand or gravel beds of rivers, estuaries and the sea-bed. The modern word "dune" came into English from French c. 1790, which in turn came from Middle Dutch dūne. Sand hitting sand is more likely to stick; sand hitting a more coherent surface is more likely to bounce (saltation). This exacerbating feedback loop helps sand accumulate into dunes. Dunes are made of sand-sized particles, and may consist of quartz, calcium carbonate, snow, gypsum, or other materials. The upwind/upstream/upcurrent side of the dune is called the stoss side; the downflow side is called the lee side. Sand is pushed (creep) or bounces (saltation) up the stoss side, and slides down the lee side. A side of a dune that the sand has slid down is called a slip face (or slipface). The Bagnold formula gives the speed at which particles can be transported. Five basic dune types are recognized: crescentic, linear, star, dome, and parabolic. Dune areas may occur in three forms: simple (isolated dunes of basic type), compound (larger dunes on which smaller dunes of same type form), and complex (combinations of different types). Barchan dunes are crescent-shaped mounds which are generally wider than they are long. The lee-side slipfaces are on the concave sides of the dunes. These dunes form under winds that blow consistently from one direction (unimodal winds). They form separate crescents when the sand supply is comparatively small. When the sand supply is greater, they may merge into barchanoid ridges, and then transverse dunes (see below). Some types of crescentic dunes move more quickly over desert surfaces than any other type of dune. A group of dunes moved more than 100 metres per year between 1954 and 1959 in China's Ningxia Province, and similar speeds have been recorded in the Western Desert of Egypt. The largest crescentic dunes on Earth, with mean crest-to-crest widths of more than three kilometres, are in China's Taklamakan Desert. See lunettes and parabolic dues, below, for dunes similar to crescent-shaped ones. Abundant barchan dunes may merge into barchanoid ridges, which then grade into linear (or slightly sinuous) transverse dunes, so called because they lie transverse, or across, the wind direction, with the wind blowing perpendicular to the ridge crest. Seif dunes are linear (or slightly sinuous) dunes with two slip faces. The two slip faces make them sharp-crested. They are called seif dunes after the Arabic word for "sword". They may be more than 160 kilometres (100 miles) long, and thus easily visible in satellite images (see illustrations). Seif dunes are associated with bidirectional winds. The long axes and ridges of these dunes extend along the resultant direction of sand movement (hence the name "longitudinal"). Some linear dunes merge to form Y-shaped compound dunes. Formation is debated. 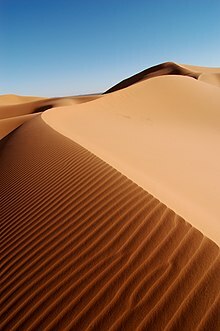 Bagnold, in The Physics of Blown Sand and Desert Dunes, suggested that some seif dunes form when a barchan dune moves into a bidirectional wind regime, and one arm or wing of the crescent elongates. Others suggest that seif dunes are formed by vortices in a unidirectional wind. In the sheltered troughs between highly developed seif dunes, barchans may be formed, because the wind is constrained to be unidirectional by the dunes. Large linear seif dunes in the Great Sand Sea in southwest Egypt, seen from the International Space Station. The distance between each dune is 1.5–2.5 km. The average-direction-longitudinal model of seif dune formation. By contrast, transverse dunes form with the wind blowing perpendicular to the ridges, and have only one slipface, on the lee side. The stoss side is less steep. Transverse dunes lie perpendicular to the wind, which moves them forwards, producing the cross-bedding shown here. Seif dunes are common in the Sahara. They range up to 300 m (980 ft) in height and 300 km (190 mi) in length. In the southern third of the Arabian Peninsula, a vast erg, called the Rub' al Khali or Empty Quarter, contains seif dunes that stretch for almost 200 km and reach heights of over 300 m.
Occurring wherever winds periodically reverse direction, reversing dunes are varieties of any of the above shapes. These dunes typically have major and minor slipfaces oriented in opposite directions. The minor slipfaces are usually temporary, as they appear after a reverse wind and are generally destroyed when the wind next blows in the dominant direction. Dune Nine in Sossusvlei, Namibia, is over 300m high. Draas are very large-scale dune bedforms; they may be tens or a few hundreds of metres in height, kilometres wide, and hundreds of kilometres in length. After a draa has reached a certain size, it generally develops superimposed dune forms. They are thought to be more ancient and slower-moving than smaller dunes, and to form by vertical growth of existing dunes. Draas are widespread in sand seas and are well-represented in the geological record. All these dune shapes may occur in three forms: simple (isolated dunes of basic type), compound (lager dunes on which smaller dunes of same type form), and complex (combinations of different types). Simple dunes are basic forms with the minimum number of slipfaces that define the geometric type. Compound dunes are large dunes on which smaller dunes of similar type and slipface orientation are superimposed. Complex dunes are combinations of two or more dune types. A crescentic dune with a star dune superimposed on its crest is the most common complex dune. Simple dunes represent a wind regime that has not changed in intensity or direction since the formation of the dune, while compound and complex dunes suggest that the intensity and direction of the wind has changed. Coastal dunes form when wet sand is deposited along the coast and dries out and is blown along the beach. Dunes form where the beach is wide enough to allow for the accumulation of wind-blown sand, and where prevailing onshore winds tend to blow sand inland. The three key ingredients for coastal dune formation are a large sand supply, winds to move said sand supply, and a place for the sand supply to accumulate. Obstacles—for example, vegetation, pebbles and so on—tend to slow down the wind and lead to the deposition of sand grains. These small "incipient dunes or "shadow dunes" tend to grow in the vertical direction if the obstacle slowing the wind can also grow vertically (i.e., vegetation). Coastal dunes expand laterally as a result of lateral growth of coastal plants via seed or rhizome. Models of coastal dunes suggest that their final equilibrium height is related to the distance between the water line and where vegetation can grow. Coastal dunes can be classified by where they develop, or begin to take shape. Dunes are commonly grouped into either the Primary Dune Group or the Secondary Dune Group. Primary dunes gain most of their sand from the beach itself, while secondary dunes gain their sand from the primary dune. Along the Florida Panhandle, most dunes are considered to be foredunes or hummocks. Different locations around the globe have dune formations unique to their given coastal profile. Coastal sand dunes can provide privacy and/or habitats to support local flora and fauna. Animals such as sand snakes, lizards, and rodents can live in coastal sand dunes, along with insects of all types. Often the vegetation of sand dunes is discussed without acknowledging the importance that coastal dunes have for animals. Further, some animals, such as foxes and feral pigs can use coastal dunes as hunting grounds to find food. Birds are also known to utilize coastal dunes as nesting grounds. All these species find the coastal environment of the sand dune vital to their species' survival. Over the course of time coastal dunes may be impacted by tropical cyclones or other intense storm activity, dependent on their location. Recent work has suggested that coastal dunes tend to evolve toward a high or low morphology depending on the growth rate of dunes relative to storm frequency. During a storm event, dunes play a significant role in minimizing wave energy as it moves onshore. As a result, coastal dunes, especially those in the foredune area affected by a storm surge, will retreat or erode. To counteract the damage from tropical activity on coastal dunes, short term post-storm efforts such as fences can be made by individual agencies through fencing to help with sand accumulation. How a much a dune erodes during any storm event is related to its location on the coastal shoreline and the profile of the beach during a particular season. During the summer, a beach tends to take on more of a convex appearance due to gentler waves, while the same beach in the winter may take on more of a concave appearance. As a result, coastal dunes can erode much more quickly in the winter than in the summer. These dunes most often form as a continuous 'train' of dunes, showing remarkable similarity in wavelength and height. The shape of a dune gives information about its formation environment. For instance, rives produce asymmetrical ripples, with the steeper slip face facing downstream. Ripple marks preserved in sedimentary strata in the geological record can be used to determine the direction of current flow, and thus an indication of the source of the sediments. A dune in Sossusvlei, in the greater Namib-Naukluft National Park, Namibia. Note the trees being engulfed for scale. Herring Cove, Race Point  and The Province Lands bicycle path in Provincetown, Massachusetts as part of the US National Park Service of the Cape Cod National Seashore. Eureka Valley Sand Dunes and Mesquite Flat Sand Dunes in Death Valley National Park, California. Indiana Dunes National Park, Indiana, on the south shore of Lake Michigan. ^ a b first edited by Fowler, H.W. ; Fowler, F.G. (1984). Sykes, J.B., ed. The Concise Oxford Dictionary of Current English (7th ed.). Oxford: Clarendon Press. ISBN 978-0-19-861132-5. ^ "Dune—Define Dune at Dictionary.com". dictionary.com. Archived from the original on 1 May 2018. Retrieved 1 May 2018. ^ a b "Types of Dunes". Archived from the original on 14 March 2012. Retrieved 8 March 2012. ^ Radebaugh, Jani; Sharma, Priyanka; Korteniemi, Jarmo; Fitzsimmons, Kathryn E. (2014). "Longitudinal Dunes (or Linear Dunes)". Encyclopedia of Planetary Landforms. pp. 1–11. doi:10.1007/978-1-4614-9213-9_460-2. ISBN 978-1-4614-9213-9. ^ Goudie, Ron Cooke; Andrew Warren; Andrew (1996). Desert geomorphology (2. impr. ed.). London: UCL Press. pp. 395–396. ISBN 978-1-85728-017-3. ^ Goudie, Ron Cooke; Andrew Warren; Andrew (1996). Desert geomorphology (2. impr. ed.). London: UCL Press. p. 395. ISBN 978-1-85728-017-3. ^ Nielsen, Ole. "Zibar Dunes". My Opera. Archived from the original on 3 November 2013. Retrieved 3 October 2013. ^ a b Lancaster, N. (1 March 1988). "The development of large aeolian bedforms". Sedimentary Geology. 55 (1–2): 69–89. Bibcode:1988SedG...55...69L. doi:10.1016/0037-0738(88)90090-5. ^ Jiang, Hong; Dun, Hongchao; Tong, Ding; Huang, Ning (2017-04-15). "Sand transportation and reverse patterns over leeward face of sand dune". Geomorphology. 283: 41–47. Bibcode:2017Geomo.283...41J. doi:10.1016/j.geomorph.2016.12.030. ^ Bird, ECF (1976). Coasts: an introduction to systematic geomorphology. Canberra, Australia: Australian National University Press. ^ Goldsmith, V (1978). Coastal dunes. In Coastal sedimentary environments. New York, NY: Springer. pp. 171–235. ^ Hesp, P. (1989). "A review of biological and geomorphological processes involved in the initiation and development of incipient foredunes". Proceedings of the Royal Society of Edinburgh. Section B. Biological Sciences. 96: 181–201. doi:10.1017/S0269727000010927. ^ Godfrey, P. J. (1977-09-01). "Climate, plant response and development of dunes on barrier beaches along the U.S. east coast". International Journal of Biometeorology. 21 (3): 203–216. Bibcode:1977IJBm...21..203G. doi:10.1007/BF01552874. ISSN 0020-7128. ^ Goldstein, Evan B.; Moore, Laura J.; Vinent, Orencio Durán (8 August 2017). "Lateral vegetation growth rates exert control on coastal foredune "hummockiness" and coalescing time". Earth Surface Dynamics. 5 (3): 417–427. doi:10.5194/esurf-5-417-2017. ISSN 2196-6311. ^ Durán, O.; Moore L. J. (2013). "Vegetation controls on the maximum size of coastal dunes". Proceedings of the National Academy of Sciences. 110 (43): 17217–17222. Bibcode:2013PNAS..11017217D. doi:10.1073/pnas.1307580110. PMC 3808624. PMID 24101481. ^ Sloss, CR; Shepherd, M; Hesp, P. "Coastal dunes: geomorphology". Nature Education Knowledge. Retrieved 4 December 2018. ^ Houser, C; Hapke, C; Hamilton, S (August 15, 2008). "Controls on coastal dune morphology, shoreline erosion and barrier island response to extreme storms". Geomorphology. 100 (3–4): 223–40. Bibcode:2008Geomo.100..223H. doi:10.1016/j.geomorph.2007.12.007. ^ Claudino-Sales, V; Wang, P; Horwitz, MH (March 15, 2008). "Factors controlling the survival of coastal dunes during multiple hurricane impacts in 2004 and 2005: Santa Rosa Barrier Island, Florida". Geomorphology. 95 (3–4): 295–315. Bibcode:2008Geomo..95..295C. doi:10.1016/j.geomorph.2007.06.004. ^ Ronica, D (2008-10-27). "How sand dunes work". HowStuffWorks. Retrieved 4 December 2018. ^ Hill, K. "Dune Habitats". Smithsonian Marine Station. Retrieved 4 December 2018. ^ Durán Vinent, Orencio; Moore, Laura (February 2015). "Barrier island bistability induced by biophysical interactions". Nature Climate Change. 5 (2): 158–162. Bibcode:2015NatCC...5..158D. doi:10.1038/nclimate2474. ISSN 1758-6798. ^ Goldstein, Evan B.; Moore, Laura J. (2016). "Stability and bistability in a one-dimensional model of coastal foredune height". Journal of Geophysical Research: Earth Surface. 121 (5): 964–977. Bibcode:2016JGRF..121..964G. doi:10.1002/2015JF003783. ISSN 2169-9011. ^ Morton, RA (May 1, 1976). "Effects of Hurricane Eloise on beach and coastal structures, Florida Panhandle". Geology. 4 (5): 277–80. Bibcode:1976Geo.....4..277M. doi:10.1130/0091-7613(1976)4<277:EOHEOB>2.0.CO;2. ^ Charbonneau, B; Wnek, JP. "Reactionary fence installation for post-Superstorm Sandy dune recovery". EarthArXiv. Retrieved 4 December 2018. ^ Maine Sea Grant. "Seasonal changes". Maine Sea Grant College Program. Retrieved 4 December 2018. ^ Miles, J. (1985). "The pedogenic effects of different species and vegetation types and the implications of succession". European Journal of Soil Science. 36 (4): 571–584. doi:10.1111/j.1365-2389.1985.tb00359.x. ^ Franklin, E.M.; Charru, F. (2009). "Morphology and displacement of dunes in a closed-conduit flow". Powder Technology. 190 (1–2): 247–251. arXiv:1608.07729. doi:10.1016/j.powtec.2008.04.065. ^ Franklin, E. M.; Charru, F. (2011). "Subaqueous barchan dunes in turbulent shear flow. Part 1. Dune motion". Journal of Fluid Mechanics. 675: 199–222. Bibcode:2011JFM...675..199F. doi:10.1017/S0022112011000139. ^ Cardona Florez, Jorge Eduar; Franklin, Erick de Moraes (2016). "The formation and migration of sand ripples in closed conduits: Experiments with turbulent water flows". Experimental Thermal and Fluid Science. 71: 95–102. arXiv:1608.04792. doi:10.1016/j.expthermflusci.2015.10.017. ^ "Ripples". Archived from the original on 1 May 2018. Retrieved 11 January 2018. ^ "Alexandria Coastal Dunefields". UNESCO World Heritage. Archived from the original on 18 November 2009. Retrieved 11 January 2010. ^ "Herring Cove Beach - Cape Cod National Seashore (U.S. National Park Service)". www.nps.gov. Retrieved 2018-07-29. ^ "Race Point Beach - Cape Cod National Seashore (U.S. National Park Service)". www.nps.gov. Retrieved 2018-07-29. ^ "Province Lands Bike Trail - Cape Cod National Seashore (U.S. National Park Service)". www.nps.gov. Retrieved 2018-07-29. ^ Mann, D. H.; Heiser P. A.; Finney B. P. (2002). "Holocene history of the Great Kobuk Sand Dunes, Northwestern Alaska" (PDF). Quaternary Science Reviews. 21 (4): 709–731. Bibcode:2002QSRv...21..709M. CiteSeerX 10.1.1.419.8948. doi:10.1016/S0277-3791(01)00120-2. Archived from the original (PDF) on 19 September 2015. ^ Smith, S. & Mark, S. (2006). Alice Gray, Dorothy Buell, and Naomi Svihla: "Preservationists of Ogden Dunes". The South Shore Journal, 1. "Account Suspended". Archived from the original on 13 September 2012. Retrieved 2012-06-11. ^ Smith, S. & Mark, S. (2009). "The Historical Roots of the Nature Conservancy in the Northwest Indiana/Chicagoland Region: From Science to Preservation". The South Shore Journal, 3. "Account Suspended". Archived from the original on 1 January 2016. Retrieved 2015-11-22. ^ Kirbus, Federico B. "Bolsón de Fiambalá". Sandboard Magazine. Retrieved 1 May 2018. Bagnold, Ralph (2012) . The Physics of Blown Sand and Desert Dunes. Courier Dover Publications. ISBN 978-0-486-14119-0. Ralph Lorenz; James Zimbelman (2014). Dune Worlds: How Wind-blown Sand Shapes Planetary Landscapes. Springer. ISBN 978-3-540-89724-8. Anthony J. Parsons, A. D. Abrahams, ed. (2009). Geomorphology of Desert Environments. Springer. ISBN 978-1-4020-5718-2. Pye, Kenneth; Tsoar, Haim (2009). Aeolian Sand and Sand Dunes. Springer. ISBN 978-3-540-85909-3. "Nouakchott, Mauritania". NASA Earth Observatory. Archived from the original on 30 September 2006. Retrieved 28 April 2006. Badescu, V.; Cathcart, R. B.; Bolonkin, A. A. (2008). "Sand dune fixation: A solar-powered Sahara seawater pipeline macroproject". Land Degradation & Development. 19 (6): 676–691. doi:10.1002/ldr.864. "Summary: Dunes, Parabolic". Desert Processes Working Group; Knowledge Sciences, Inc. Archived from the original on 21 October 2010. Retrieved 6 October 2010. "Fighting wind erosion. One aspect of the combat against desertification". Les dossiers thématiques du CSFD. Archived from the original on 25 July 2011. Retrieved 4 January 2011.